Gypsytechno is ongoing multimedia work based on footages from Roma festivities around Balkan and my techno DJ sets. Once during the long journey around Balkans, I came to a great rural holiday. Paradoxically, this action reminded me of the hipsters techno festival Sunwaves, which take place annually 70 km south. This feeling led me to the idea of ​​combining two opposite, but in fact very folk roots phenomen: rural festival and techno music. Choreography of dancing, produced for centuries, the scenography of the holiday, is very close to what we can see on techno parties. I tried to combine these two phenomena and put my techno mix on this footage. I began to collect these videos. The absolute virginity of these videos is fundamental to me. I do not do the editing. I do not introduce the narrative. These are original videos, such as are. My channel in YouTube, on which I upload these works is very popular. At the moment, these videos looked at a total of about 1,000,000 viewers. The most important aspect of the mystical involvement of a person into the surrounding world is the establishment of connections between the actions of the subject and the situations allegedly provoked by such actions. But what form does such natural thirst for participation takes in urbanized socio-cultural conditions? Techno-culture has become our new ritual – it creates a temporary community, where atmosphere of equality reigns and peaceful coexistence of the community members during the ritual is a priori. Nikolay Karabinovych coherently splits urban mythology by mixing techniques, uses anthropological analysis of the nature of modern feast and conducts partisan propaganda of unity in ritual. He invites a visitor to join the ritual by exploiting the ecstatic temporality of the temporary community in the feast situation. In the familiar atmosphere of a techno-party the visitor can share the joy of dancing with the inhabitants of the Roma settlements of Macedonia, Bulgaria and Romania. Synchronous reproduction of video and audio materials has a common rhythmic base. It is the rhythm that allows the visitor to immerse in the situation of the proposed video archive and compare his usual ritual with the traditional Roma festivities and the unity of the rhythm makes this immersion softer and more amusing — as a reaction of recognition takes place. 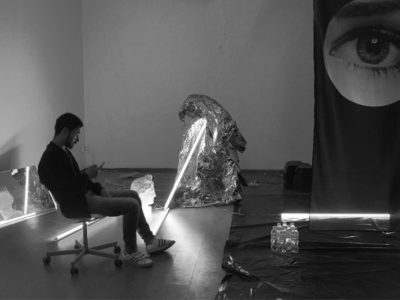 The body of the project “Gypsytechno” is digital – the project is aimed primarily to work with the internet audience, which connects to the scheme of transfer of the dance and feast spirit. Mass ritual activities of Roma pushes the audience to reflect on the phenomenon of the feast and to create their own private parties: today we will dance techno not only in our usual community, but we`ll unite our party with the Roma feast. This combination of video and audio allows the audience also to combine simple and attractive forms of leisure – listening to techno and watching weird videos. Physical realization of this work is possible only in the situation of the party, when the music plays loud and everyone is ready to dance, as the visitor here is an active participant in the relational project and immersing in the work is possible only in presence of unhindered reaction of audience transfer. The Closer Art Center is an ideal venue where it is possible to exhibit such work continuously, as such a unity of the art center and the main techno-mecca of the country allows to reveal the very essence of the DJ method of work as the communism of forms. After all, contemporary art tends to abolish the phenomenon of ownership of forms, and any element can become actor of a new relationship. In accordance with the position of the French critic and curator Nicolas Bourriot, “Any DJ today works basing on the principles inherited from the historical avant-garde, whether it is a deviation, a response or supplemented ready-made, dematerialization of practice, etc.” – the project Gypsytechno can be called “twice-added ready-made” – the audio-visual part of the work itself is a product of mixing, but its subsequent exposure is impossible without labour of DJs playing in Closer, and of course the presence of club visitors.